Water continues to fall unabated from the sky. 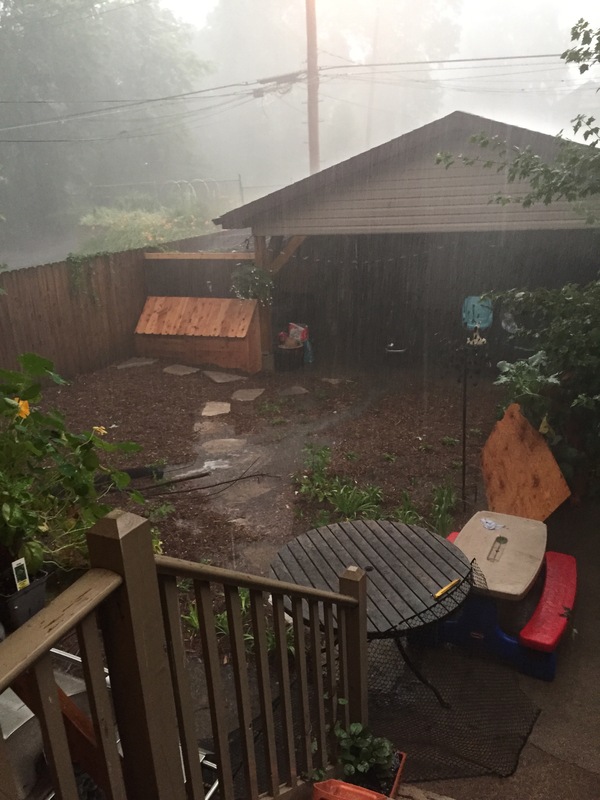 When we moved here, I literally did not even own an umbrella or something called a “raincoat.” I cannot express to you how disconcerting it is to have hundreds of gallons of water spew off my home like a roman candle and people simply go about their business as if everything is normal. No matter how much it rains the locals do not seem concerned, but I have begun to plan construction for a wall around our home to keep out the water. *Update, as seen below, my initial “levees” (local dialect) have failed. The chickens have taken to the lifeboats in hopes of surviving the flood waters, I wish them the best of buh gawk. Because honestly people, when is this something that should ever happen? 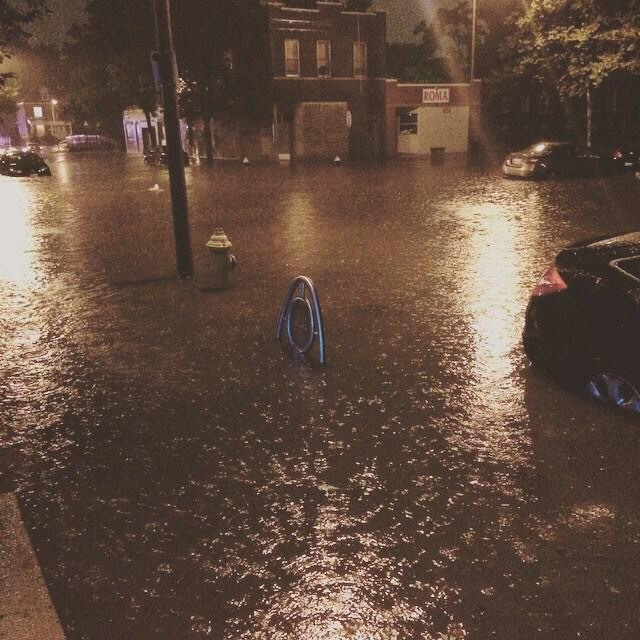 For awhile there cars were floating down the street, accompanied by cats on pizza boxes. 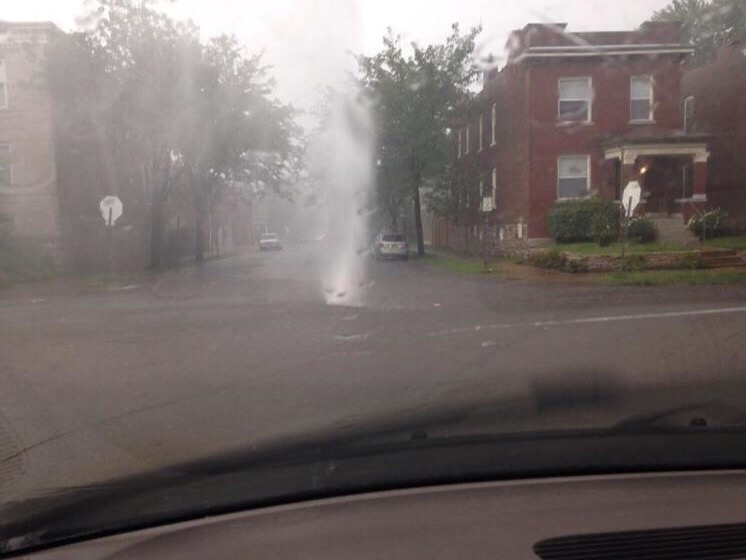 Add to the River St. Louis above our very own geyser below and poop just got very real. Apparently, there are massive concrete tunnels (not created by aliens) underneath the city that carry water away to dispose of it and even these tunnels are completely full. Despite these water logged challenges, we shall persevere. We will continue our water envelope shipments to California in hopes of alleviating some of the problems; in exchange for avocados, limon Cheetos and fish tacos. P.S. Avocados are running dangerously low. Next Article Why Compliance Matters to You; or it Should. Someday you will look back and laugh, but I’m sure right now I’m sure you are not the least bit amused! Too true! Hard to believe but pool sized water will be funny! HA! St. Louis native who now lives in CA. I miss the rain! Looks like you live in south city(grew up in South City and I can tell by the way the buildings look); excellent choice of area/neighborhood. The next time your chickens decide to leave you, go to Soulard Farmer’s Market (where you can buy live chickens) and replace them. Avocado, limon Cheetos, and avocados can be found all along Cherokee Street. Could probably find avocados at the farmer’s market too. I really do miss STL sometimes!